This saying is trustworthy and true: "History repeats itself." Most everyone has heard the phrase, but why is it true? It is true that history repeats itself, not because all the individual circumstances and characters line up exactly as they were in any given historical account, but because the natural world has not undergone extensive, redefining changes. Nature continues its constant, un-rushed, consistent pattern of absolutes. Here are a few examples of nature's absolutes that I am referring to: Men and women still attempt to usurp the throne of God as sovereign ruler and law-giver. The earth's heating and cooling patterns cycle every once in a while because God designed it that way. There is no such thing as global warming. The seasons continue their changes, uninterrupted and certainly never rushed. I have heard many Christians lately speak out against the widespread acceptance of transgender bathrooms, both in private businesses and now in public schools. I, too, have spoken out against them, attempting to remind those who listen of the foundational truth that God has created man and woman and nothing in between. Gender identity is little more than selfishness and sin. Identifying as any gender other than the one you biologically are is nothing less than choosing to sin, which is usurping God's law and will be dealt with accordingly. Lately, I have been disturbed and saddened by the number of professing Christians who have gone so far as to speak out against transgender bathrooms with hostility and anger. I heard one man on the radio yesterday who called in on a particular talk-show to boldly state, "I say we take [the business] down in flames!" The host was quick to assure his listeners that the program did not support violence, and it was concluded that the analogy was figurative. But the hatred was still there. So what is a Christian to do? How is a Christian to respond to such lawlessness? I want to remind the reader of a similar time in history when such defiance toward God was so widely accepted. In the book of Jonah in the Old Testament we read of the story of a man named Jonah, a prophet of God. God told Jonah to go to Ninevah, the most wicked city in the entire area. The capital city of the Assyrians boasted of so great a wickedness that God declared, "Their wickedness has come up to Me." Out of all the people on the world and all the cities on the world, this city's evil had reached God as the most defiant of all cities. So God told Jonah to travel to Ninevah and preach to the people this message: "Repent! God knows your wickedness and is going to wipe you off the face of the earth, unless you turn away from your wickedness in shame and sorrow. Therefore, repent and escape the coming judgement!" Jonah, however, did not want the people of Ninevah to be spared from judgement. "They are so wicked, God. How can You be a good God and forgive such wickedness?" he questioned. So Jonah ran from the mission on which God had sent him. He sailed in the opposite direction of Ninevah, but God sent a storm so that boat threatened to sink, and the sailors threw Jonah into the sea. Then, a big fish swallowed him up and kept him in his stomach for three days and nights. Finally, Jonah repented of his own sin against God and the fish spat him onto dry land. Having been disciplined by God for his own disobedience, Jonah continued to Ninevah. The city was so big it took three days to walk from one end to the other. But Jonah did as he was told by God and preached God's message of repentance and grace to the whole city. At the end of his preaching, Jonah went to a mountain that overlooked the city and watched, anxiously anticipating the destruction of the wicked city of Ninevah. As Jonah was sitting on the mountainside, the sun grew increasingly hot, so God caused a leafy vine to grow up quickly and cover Jonah from the heat. Jonah was happy and content and continued to wait. A little while later, though, God sent a worm to eat the vine, so that the sun was scorching Jonah again. Jonah was very angry at God that the worm had destroyed his shade so he told God angrily, "It is so hot I want to die!" 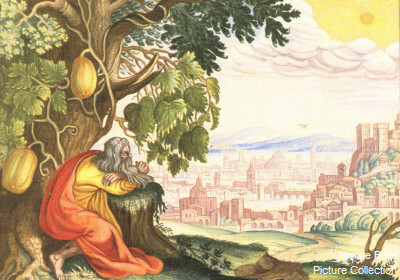 God asked Jonah, "Do you have any right to be angry about the plant? You did not cause it to grow or cause it to give you shade. Yet look at Ninevah: it is a city of 120,000 people who do not know their right hand from their left. Should I not care for them, since I, too, created them?" The people of Ninevah responded to God's message with repentance and sorrow and shame. They changed their ways, so God relented and did not destroy the city, despite Jonah's anger. Let us put off passivity and instead call sin what it is, and, knowing the truth and having been set free from the captivity of sin, engage in controversial issues, not back down from them. Let us put off the angry pride of the flesh that desires revenge (as if we have been wronged!) and instead put on the love of Christ to courageously speak of God's forgiveness of sins to a people who do not know of His great love for sinners. Let us put aside the worthless thinking of this age and instead reform our foundation on God's Word - rebuilding the foundation in ourselves, our families, our churches, and our communities. Let us put off the fruitless works of selfishness and wastefulness such as video games, television, and movies and instead absorb ourselves in prayer, study, and worship. Brothers and sisters, I pray for all of you that you may be strengthened in the power of our Lord until the day He comes again to make all things right. "But the one who endures to the end, he will be saved" (Matthew 24:13).